… and it’s a bird, and certainly not your common garden bird by any stretch of the imagination … but I digress. This particular bird is called Jackdaw and it’s a very welcome addition to the Clapton restaurant and somewhat groovy jazz cafe music scene - eat your heart out Soho!! A friend who shall rename anonymous (B) had been there a few weeks earlier and was so taken with the food and the place in general that she decreed that her birthday celebrations would be held there (a high honour indeed). What’s more after eating we’d all take advantage of the downstairs music space and dance the birthday cake off - live jazz or real vinyl nights - take your pick. I got a rare opportunity to check things out early and chat to the chefs. Talking to them made me really look forward to dinner. Their passion for good food was reflected in their approach to sourcing their ingredients (as local and sustainable as possible) and how they look at what’s good that day, get inspired, and keep it simple. Stick to 3 or 4 really good ingredients on a plate and let all the flavours shine. As I watched them tending their creations I saw the world’s biggest ever whole unpeeled beetroot that had been slowly cooking away on a grill top since morning. Chef said it would give it a sweet and slightly smoky taste and so I made a mental note to look out for it and where it would appear on the menu later. Their fermenting range of fruit and vegetables caught my ever alert eye and they enlightened me as to how they change taste and texture wise over time and how that gives them new ideas - who knew!! As there were quite a few of us for dinner we had a set menu with choices to cater for everyone. There is a larger menu with bigger and smaller plates and some lovely deserts – all “on the day" creations. The food Ted if you will FHS ...ok ok … I had a mackerel croquette with a lovely fine crispy shell that gave way to a creamy textured filling. 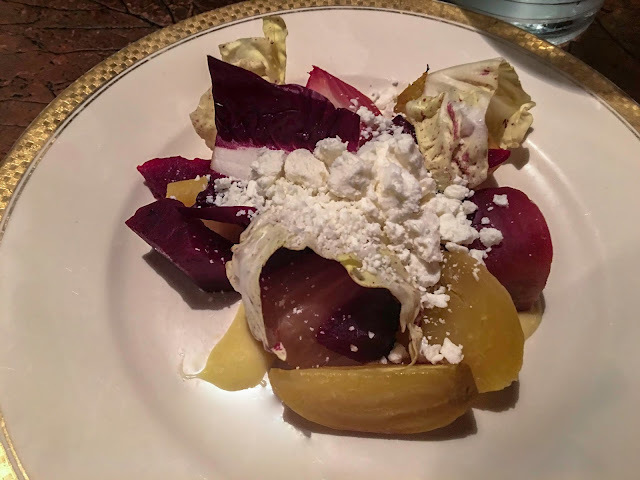 Then I spotted that the heritage beetroot accompanied by its yellow cousin and some crumbled frozen feta goats cheese was now a fabulous salad so I stuck my fork in and it was all the sweet and smoky deliciousness promised earlier! My shorthorn onglet steak with wild mushrooms and black cabbage was perfectly cooked and just well ... really delicious. My neighbour had salmon and crushed potatoes and again the Ted fork plunged (politely of course) into a great reward ... everything was cooked with obvious skill and experience and a real feel for the ingredients. Then we headed downstairs for great jazz and the dancing started … Jackdaw is planning evenings where the dishes are matched to wines from a local wine bar and even more live jazz. Jackdaw is your quintessential local Clapton - they are open from breakfast till late and they give you exactly what you feel like when you wander in – they are local flavour, colour, and culture … if this was my local I'd be there everyday. This inspired me so much that I Googled the place and looked all their photos. Looks fantastic. Sounds like you enjoyed it! That looks amazing! Who was playing the Jazz? Ted is quite the gourmand. How is he as a dancer?